The last time we saw writer/director Dan Gilroy, his wife, actress Renee Russo, and Jake Gyllenhaal in the same film was the creepy but well-received Nightcrawler. This trio returns in Velvet Buzzsaw, a satirical horror film that literally skewers the contemporary art world of today’s Los Angeles. Morf Vandewalt (Gyllenhaal) is a bisexual, snarky art critic whose reviews of exhibitions can make or break an artist or a gallery. He has tired of live-in lover Ed (Sedale Threatt, Jr.) and eventually hooks up with Josephina (Zawe Ashton) who has just broken up with her artist boyfriend. Josephina works as an agent for gallery owner Rhodora Haze (Russo), a former member of the punk band Velvet Buzzsaw who sports its tattoo on the nape of her neck. Josephina spots an elderly man lying dead in her apartment building hallway. The corpse is Ventril Dease (spoiler alert: this is an anagram of “Devil Seed Art”), an artist whose numerous paintings are about to be discarded by the property manager. Josephina “rescues” this collection and shows it to Rhodora, Morf, art curator Gretchen (Toni Collette) and Piers (John Malkovitch), an older artist mired in a creative block. All are struck by the compelling originality of these paintings. Rhodora smells some big bucks here and, after a massively successful public showing, she sequesters most of the paintings to ramp up their scarcity and price. Morf discovers that Dease was a former mental patient who was confined to a psychiatric hospital for the brutal murder of his abusive father. Released when the facility closed, Dease continued his lurid, highly personal artwork and used his own blood to create the reds and blacks on each canvas. The paintings contain much more than initially meets the eye, and when some of them come to life, there is an escalating series of deaths, starting with the Haze Gallery’s worker Bryson (Billy Magnusson), and rival gallery owner Jon Dondon (Tom Sturridge). Morf experiences disturbing visual hallucinations and, after learning that Dease had ordered his paintings destroyed after his death, he begs Rhodora to stop their sale but it is already too late and the death toll continues to rise. 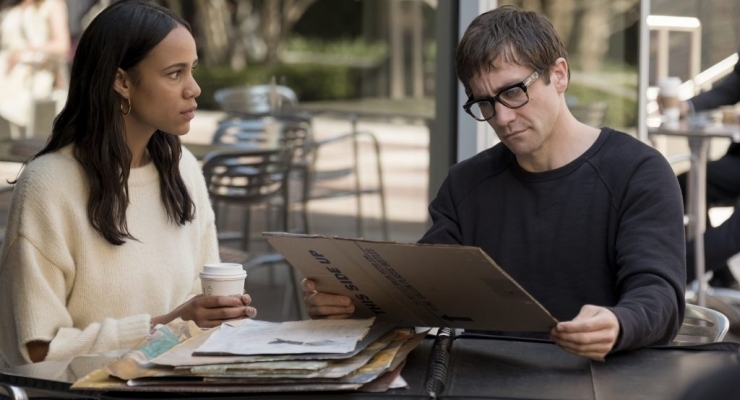 Velvet Buzzsaw is a 21st-century allegory in which those who appreciate art for art’s sake are spared while those who use art simply to make money fall victim to the proverbial grim reaper which, in this case, is the spirit of the dead artist. Dan Gilroy exposes the pretenders and offenders of the contemporary art scene as his cameras provide visual evidence of some of the crap that passes for creative genius. To further his cause, Gilroy has assembled a cast of A-listers that carries out their roles to perfection. Jake Gyllenhaal is the ultimate effete snob with all the requisite mannerisms; Renee Russo and Toni Collette are screen veterans who provide terrific impersonations of money-hungry art hustlers. The redoubtable John Malkovich, in a limited role, is the most credible of all as an artist struggling to find his elusive muse. I did not mind that the dispatching of several characters seemed right out of a Blumhouse Productions gore-ridden playbook, since it is clear from the start that this film is not intended to be taken all that seriously. 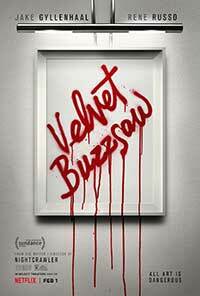 Velvet Buzzsaw joins my list of guilty pleasure movies that entertain without straining one’s brain. Dan Gilroy has crafted a dark satire, replete with horror-film elements, on the Los Angeles contemporary art world. An A-list cast including Jake Gyllenhaal, Renee Russo, Toni Collette, and John Malkovich are archetypal members of this self-serving social set that often value money over art and pay a supreme price thanks to the restless spirit of a dead artist.